Practice identifying and naming CVC medial sounds using these simple cards! 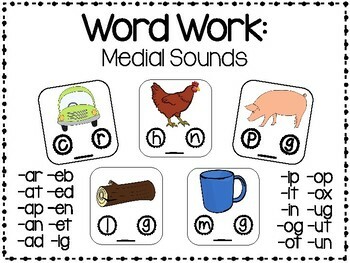 Students can work independently during word work or language arts with these cards covering all of the different medial sounds. Each card has a picture to go along with it. Laminate the cards and have the students use an Expo marker to write letters or have them use letter pieces to complete medial sound. Also be sure to check out the ending sound cards also in my TpT store!